I thought this was a thread in Spirituality. Maybe it can move there? Edited by coorsmikey, 11 December 2016 - 02:03 AM. Thank you for the relocation mikey ! Edited by Skywatcher, 06 October 2016 - 10:03 AM. I fucked up and did something right? The ratio of the circumference of a circle to its diameter, Pi, is the original transcendental and irrational number. (Pi equals about 3.141592653589793238462643383279 50288419716939937511...) It cannot be expressed in terms of the ratio of two whole numbers, or in the language of sacred symbolism, the essence of the circle exists in a dimension that transcends the linear rationality that it contains. Our holistic perspectives, feelings and intuitions encompass the finite elements of the ideas that are within them, yet have a greater wisdom than can be expressed by those ideas alone. 638117720309180...) The golden ratio is the unique ratio such that the ratio of the whole to the larger portion is the same as the ratio of the larger portion to the smaller portion. As such, it symbolically links each new generation to its ancestors, preserving the continuity of relationship as the means for retracing its lineage. phi = apothem to bisected base ratio in the Great Pyramid of Giza. phi = ratio of adjacent terms of the famous Fibonacci Series evaluated at infinity; the Fibonacci Series is a rather ubiquitous set of numbers that begins with one and one and each term thereafter is the sum of the prior two terms, thus: 1,1,2,3,5,8,13,21,34,55,89,144... (interesting that the 12th term is 12 "raised to a higher power", which appears prominently in a vast collection of metaphysical literature). The mathematician credited with the discovery of this series is Leonardo Pisano Fibonacci and there is a publication devoted to disseminating information about its unique mathematical properties, The Fibonacci Quarterly. This most aesthetically pleasing proportion, phi, has been utilized by numerous artists since (and probably before!) the construction of the Great Pyramid. As scholars and artists of eras gone by discovered (such as Leonardo da Vinci, Plato, and Pythagoras), the intentional use of these natural proportions in art of various forms expands our sense of beauty, balance and harmony to optimal effect. The outline of the Parthenon at the Acropolis near Athens, Greece is enclosed by a Golden Rectangle by design. Phidias directed and supervised the construction of the Parthenon in 434 BC, as well as designing the sculptural decoration. The mathematical golden ratio is represented by the Greek letter 'phi', taken from Phidias' name because Phidias employed the ratio in making the Parthenon and sculptures, which perfectly exhibit the proportions of the golden ratio. This most aesthetically pleasing proportion, phi. The Vesica Piscis is formed by the intersection of two circles or spheres whose centers exactly touch. This symbolic intersection represents the "common ground", "shared vision" or "mutual understanding" between equal individuals. The shape of the human eye itself is a Vesica Piscis. The spiritual significance of "seeing eye to eye" to the "mirror of the soul" was highly regarded by numerous Renaissance artists who used this form extensively in art and architecture. The ratio of the axes of the form is the square root of 3, which alludes to the deepest nature of the triune which cannot be adequately expressed by rational language alone. This spiral generated by a recursive nest of Golden Triangles (triangles with relative side lengths of 1, phi and phi) is the classic shape of the Chambered Nautilus shell. The creature building this shell uses the same proportions for each expanded chamber that is added; growth which follows a law everywhere in evidence. A fractal is a natural phenomenon or a mathematical set that exhibits a repeating pattern that displays at every scale. If the replication is exactly the same at every scale, it is called a self-similar pattern. It's always fascinating how nature propagates the same essence regardless of the magnitude of its expression...our spirit is spaceless yet can manifest aspects of its individuality at any scale. The 3/4/5, 5/12/13 and 7/24/25 triangles are examples of right triangles whose sides are whole numbers. The 3/4/5 triangle is contained within the so-called "King's Chamber" of the Great Pyramid, along with the 2/3/root5 and 5/root5/2root5 triangles, utilizing the various diagonals and sides. The 5 Platonic solids (Tetrahedron, Cube (or Hexahedron), Octahedron, Dodecahedron and Icosahedron) are ideal, primal models of crystal patterns that occur throughout the world of minerals in countless variations. These are the only five regular polyhedra, that is, the only five solids made from the same equilateral, equiangular polygons. To the Greeks, these solids symbolized fire, earth, air, spirit (or ether) and water respectively. The cube and octahedron are duals, meaning that one can be created by connecting the midpoints of the faces of the other. The icosahedron and dodecahedron are also duals of each other, and three mutually perpendicular, mutually bisecting golden rectangles can be drawn connecting their vertices and midpoints, respectively. The tetrahedron is a dual to itself. These are stellations of a dodecahedrons where each pentagonal face is capped with a pentagonal pyramid composed of 5 golden triangles, a sort of 3-dimensional 5-pointed star. Metatron's Cube contains 2-dimensional images of the Platonic Solids and many other primal forms. This is great stuff. Add to this "Gödel, Escher, Bach"
There is also sacred geometry in music. Tones use the same relationships. i.e. 4ths, 5ths, etc. I wonder what music "looks" like when translated into form. Edited by catattack, 11 December 2016 - 11:24 AM. That is cool! Thanks Cat! 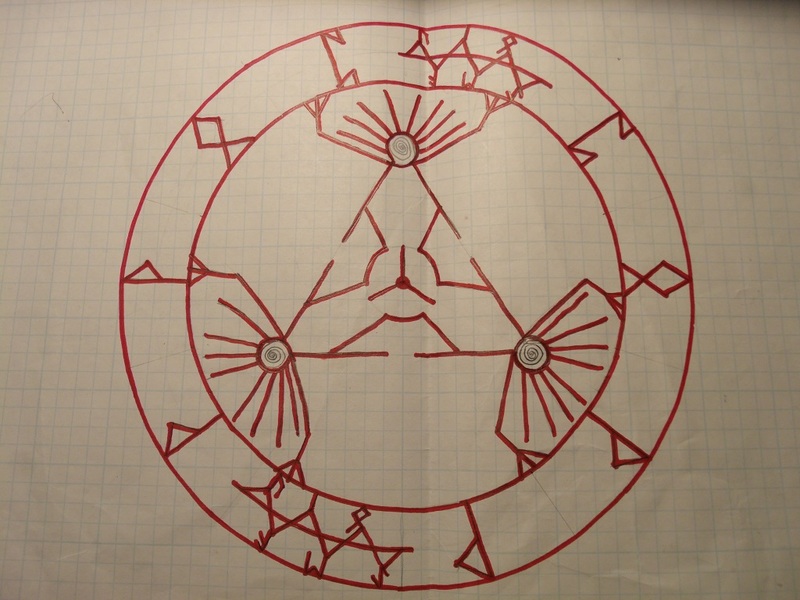 Here is a graphic used in magical working, particularly a sonic performance called galdr, of a runic formula. The idea is music "sung" back into the lattice, the "sacred words", can be used to manipulate it. Cool Arathu! I like that sigil. I'm going to have to research that. I "hear" (ha ha) you about how music becomes visual form. I see cubes of sound coming out of my Marshall when I'm cranking tunes...And am "in the space". Colorful cubes and other geometric shapes pour out like fruit from a cornucopia. I drew this sigil on the paper after drawing the runes from a blue bag (it's where I keep my staves actually) My brother, before he died, described my bag almost to the letter....yet he did not know the symbols that were in it. Wow, had to look up fujara flute. That's a cool sound!